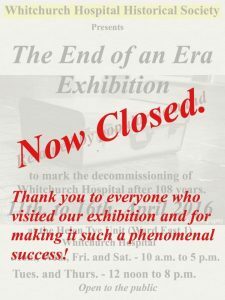 Thank you to everyone that supported and visited our exhibition during March and again this week. We have had so many visitors it has been amazing. We hope you have enjoyed the experience as we all have. Thank you for putting on the exhibition a second time as I missed it the first time. I was delighted to meet former colleagues of my mother Staff Nurse Dorothy Spackman, and the fact that they remembered her from 40+ years ago was amazing! I was so glad I took some old photos with me as these helped to jog their memories. I have more photos if you are interested. Thank you so much for your comments and I am glad you were able to come along to the exhibition. Mike was telling me that he had met you and worked with your mother back in the 1970ies.